Another busy term for PCP, this time organising the PCP Conference, organisation of the Academic Forums and releasing the PCP SSC Application to Year 1/Year 1 GEP MBBS students. It is time for our Easter Break and such wanted to wish everyone a lovely Easter, a relaxing holiday and will hopefully see some of you at our final Academic Forums. If you have any questions for us, do not hesitate to contact us here or on our Facebook page. Finally the weekend of the pcp conference 2019 "BETWEEN a rock and a hard place"! It has been a long time in the making! Our PCP Conference Lead, Jonas, had the amazing opportunity in organising our two day conference event "Between a Rock and a Hard Place". Alongside Jonas, there were a group of dedicated conference committee members, volunteers and helpers to help run the whole event.This includes designing the sc​enarios to making sure we had enough tea/coffee/food during our lunch break. It was a successful event and many congratulations for those involved. We received some good feedback from all those that attended and any improvements suggested will be implemented for our future events. Details of both days will be described below with some great pictures from the weekend. We started early in the morning setting up the Pathology Museum and lecture theatre for the arrival of our conference delegates with some arriving as early as 8:30 on the dot. 2) Second speaker was 4th year medical student, Zakaria Rob. He discussed two cases that he attended during his MEDIC 2 shifts. With incorporation of human factors but also reflections of both shifts. 3) Our final speaker was our PCP Lead Paramedic, Craig Cassidy. He discussed his personal experience during the 7/7 attack and some of the difficult conditions he had to work in. Like Maria's talk, he discussed how his bandwidth was personally affected and crucially how it can be easily taken up in situations like this. We are glad to host the 2019 National Student Conference in Pre-Hospital and Emergency Medicine on 6th-7th April 2019. We will have a weekend of fantastic morning talks from experts in the field of Pre-Hospital Medicine, covering difficult environments they have worked in and how they overcame the challenges they faced. So if you are a student interested in prehospital medicine or still contemplating what specialty you would like to go into, then this conference is for you! We are glad to announce we have opened our PCP SSC application for the Bart's and the London MBBS programme for Year 1/Year 1 GEP students. 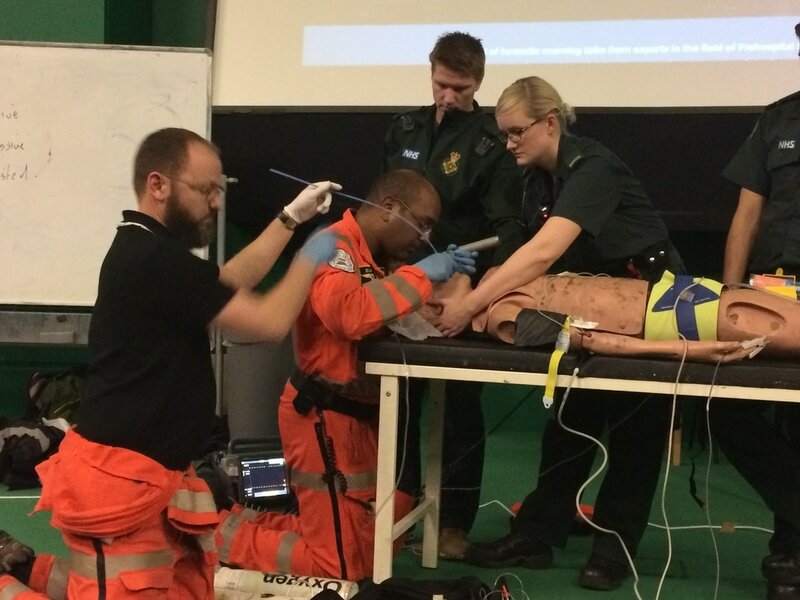 We strongly encourage you to apply if you hold an interest in prehospital medicine, as the Prehospital Care Programme will give you an unrivalled insight into this unique and challenging area of medicine. You’ll be assigned an LAS paramedic mentor to join on shifts, and in your third year on the programme you’ll join the London HEMS team for night-time observer shifts. You’ll also get to take part in student and clinician led training evenings, and present at our academic forums. N.B. Only MBBS students in Year 1/Year 1 GEP at Bart's and the London can apply for this SSC programme. 1) Dr Mike Christian is a critical care doctor who had worked for a number of years in Canada. Has since come to the UK and is currently the Research & Clinical Effectiveness Lead - HEMS Doctor with London Air Ambulance. He is also a specialist medical officer/flight surgeon with RCAF and has worked all around the world. He spoke to us about building resilience to operational stress and exposures to trauma, with this drawing on some of his own experiences back when he was a paramedic until now. 2) Our next speaker was Dr Matthew Walton. He works closely with Dr Christian on the topic of trauma and resilience. For this Academic Forum, he spoke about psychological resilience in Pre-Hospital Medicine. The talk will include a film screening and presentation. The film screening (shown above) was a project involving multiple doctors and healthcare professionals providing great insight into approaches to resilience. 3) Our first student speaker was Payal Karia, a 3rd year Medical Student (2nd year PCP student), who discussed a case she had attended last year. With the aim to discuss an impact of a case but also the thoughts behind it and incorporating the theme of resilience. 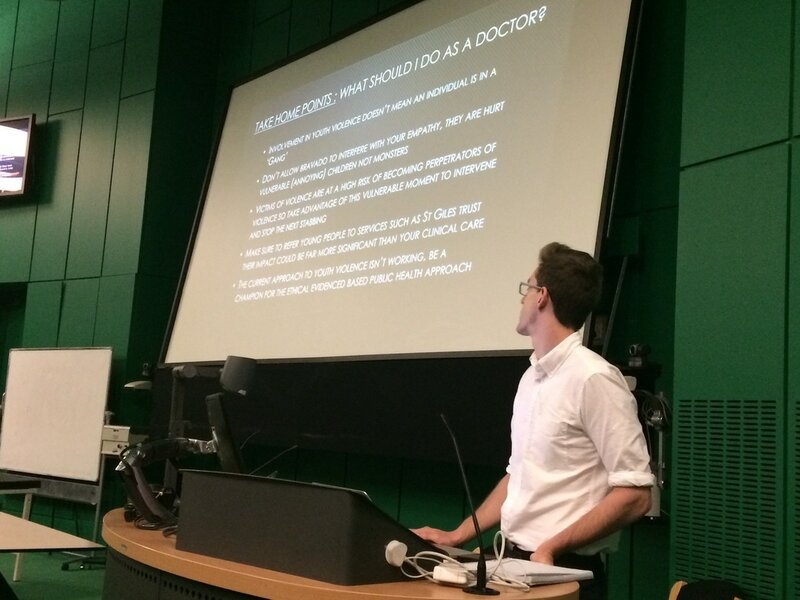 4) Our 2nd speaker was Jonas Schlautmann, another 3rd year Medical Student (2nd year PCP student), discussing a case he had attended and the reflective questions he had at the time. Again with the aim of the presentation to discuss thoughts of the case and the key topic of resilience. 1) Prof. Mark Wilson, a consultant neurosurgeon and pre-hospital specialist working at Imperial College and as an Air Ambulance doctor. His main specialist area include acute brain injury and its early management and is the co-director of Imperial neurotrauma centre. In addition to this, has worked overseas and as an expedition doctor for expeditions to Arctic and Everest. He is also the co-founder of GoodSAM (https://www.goodsamapp.org/home) – an app that alerts doctors, nurses, paramedic and those trained in basic life support to emergencies around them. 2) Andrew Whitehouse, a Paramedic with the London Ambulance Service. He took us through a curveball of a case, to demonstrate all is not what it may seem.... The presentation was interactive and this brainteaser of a case is a great opportunity for all to practice their deductive skills. Image illustrating how GCS may not indicate severity of a brain injury. 3) Our student speaker was, Matthew Sibley, a 4th year medical student (3rd year PCP student), who took us through a case that he had attended in the last year. The case is based around the theme of head injuries. In particular, the pathophysiology of head injuries as well as the symptoms they may present with or mimic. An interesting presentation with a student's first hand perspective. Two PCP students, Rosa and Rosie won an essay competition to be able to go and attend the ATACC course up in Yorkshire. We hope they had a great time and we can't wait to hear what they learnt! We would also like to thank the ATACC team for allowing us to attend and thanks to Sean for organising the competition. For some this year has flown by... and indeed it has! We hope that you have all had an enjoyable Christmas break and soon enough we will be saying hello to the 2019 year. That's all folks for the 2018 year! Hope you have all enjoyed all the talks we have had so far. Our next AF is back on 29th January 2019. - Holding our PCP National Conference (so watch out here, Facebook or Twitter for more details out soon). - Speaking to BL 1st Year MBBS students about Prehospital Care Programme SSC application process. Third PCP Academic Forum of the 2018/2019 year! 1) Rosie Burd, a 3rd year PCP student, who discussed a case she had attended, which covered the clinical side of the case as well as an overall reflection of the case. Alongside her, Sean Harris, PCP Lead Paramedic spoke more about what was involved on scene but also working in cramped conditions, which may be required in a major traumatic event. 2) Dr Halden Hutchinson-Bazely, a RAF anesthetics trainee, pre-hospital doctor with LIVES and course director of the ATACC. His talk was based on life threatening injuries for example blunt force trauma with an aspect on decision making skills required and process of extrication. 3) Final talk was from Graham Chalk, a HEMS paramedic, who walked us through the crucial decisions made by HEMS Paramedics in the LAS control room, as they decide who to send the air ambulance and its advanced trauma team to. Second PCP Academic Forum of the 2018/2019 of the year. 1) Vaneesa Keeley, a 3rd PCP Student, who spoke about a case she attended last year. The talk consisted of a description of a case where there was a difficult extrication due to the nature of the environment that the crew on scene were in. There was also a discussion on prehospital resuscitation and the guidelines that are in place for these events. 2) Dr Sameer Mal, who is a London Air Ambulance HEMS doctor, spoke about his work in Australia and the major difference in prehospital medicine there and in the UK. With a major difference on distance from rural locations to major trauma centres. In addition, Dr Mal spoke about the various terrains that they would need to work in, in Australia - with this the extensive training that they would need to go through continously. Our first PCP Academic Forum of the 2018/2019 of the Year, which was organised by 3rd year Sruthi Vydyula. The forum explored the risk of knife crime and violence in London. 1) Started off with a talk by 3rd PCP Student, Ellen Richards, who discussed a case she had attended in the last year. With her discussing this case is Dr Gareth Grier, a HEMS doctor, and bought his perspective on this case. 2) Followed by a talk by Dr Duncan Bew, clinical director for Trauma and Acute Surgery at King's and is involved with the charity Growing Against Violence. 3) A panel was then set up that included Sean Harris (PCP Lead Paramedic), Dr Duncan Bew, Shareef Mahdi (Volunteer with StreetDoctors) and Dr Gareth Grier. This involved a discussion between the panel based on a question that was asked about by the audience (image shown on right). Welcome to the 2018/2019 year of PCP! We would like to introduce our new committee who will be providing a great series of forums from both expert and student speakers as well as hosting this years National PCP Conference. Our first academic forum will be held on 25th September 2018. Information is available on our Facebook page and Twitter page, so please like/follow us! Hello and welcome to a new year of the PCP! An all-new committee hopes to bring you an exciting year of practicals, forums, and more so watch this space for more information. Our first academic forum will be held on the 31st October 2017. More information is available on our Twitter Feed and Facebook Page, and a debrief will be posted here in the days after the forum. PCP Applications are now closed. Many thanks to all of you who have applied. ​- We look forward to meeting the new PCP Cohort very soon! We are sad to announce that Tuesday 25th April saw our last Academic Forum of the Academic Year. The final forum was based around the theme of Nerve Agents. The evening opened with Graham Chalk, Lead Paramedic & Clinical Liaison Officer in the LAA. Graham acts as the main point of contact between London's Air Ambulance and London Ambulance Service. in 2015 Graham became Paramedic Education & Development Lead. He also acts as lead faculty member for the Pre-hospital Care Course and a member of Board of Directors at Association of Air Ambulance. Graham discussed the challenges the paramedics who work tirelessly at the HEMS dispatches desks face. Sharing real 999 calls received by the HEMS desk, Graham taught the audience the difficulties in interrogating members of the public in order to decipher those patients who are in most need of the HEMS unit. This was a very eye opening talk, and gave the audience a completely different perspective of pre-hospital medicine. After the break we were joined by Dr Gareth Grier - Con-convenor of the Prehospital Medicine iBSc. A familiar face to the PCP and academic forums; Dr Grier is a Consultant in Emergency Medicine and Pre-hospital care, working with the LAA. Dr Grier delivered an interactive lecture on chemical nerve agents, with a particular focus on Sarin. Recruiting members of the audience to act as members of the public, members of parliament and police and HEMS doctors and paramedics - the scenario re-enacted a sequence of events to re-enact a chemical attack in London. The presentation taught us the toxidrome of nerve agents, and how people may present if exposed to Sarin, as seen recently in the Syria attacks. It re-instated Graham's talk earlier on how a paramedic working in the control room might react. The session focused on how we felt the emergency services would respond in such a scenario - reflecting on escalating a major incident and the issue of decontamination. It was discussed how such an event might be managed in the capital - with the take home message of being able to recognise characteristics of such nerve agents on people. 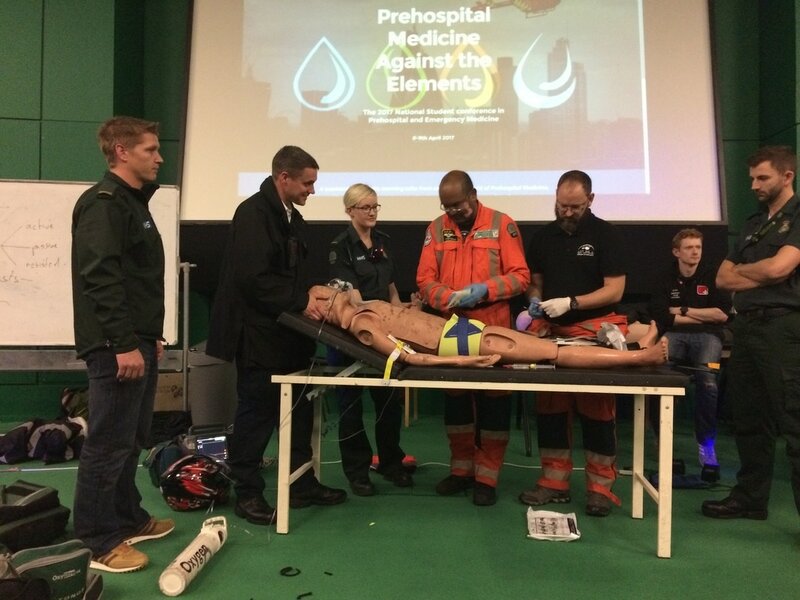 April 8-9th this year saw PCP host their National Conference: Prehospital Medicine Against the Elements. The weekend consisted of a mixture of talks, practical sessions and moulages - based around the four elements: EARTH, FIRE, AIR and WATER. ​The morning kick started with talk on triaging from Craig Cassidy — Lead Paramedic for the Prehospital Care Programme, an LAS First Responder Paramedic, and an Honorary Clinical Lecturer at the Barts and The London School of Medicine and Dentistry. Craig explained the importance of the triage algorithm in major incidents with multiple casualties, and how this was going to be utilised later on in the day when taking part in the moulage scenarios. ​ Clinical Academic lecturer in Emergency Response at the Humanitarian and Conflict Response Institute (HCRI) at the University of Manchester, Dr Hughes has extensive experience in the field of humanitarian and emergency medicine, receiving an MBE for her services in 2015. Dr Hughes has also worked for LAA, The Royal Flying Doctors in Australia and Kent, Surrey and Sussex Helicopter Emergency Medical Services. Dr Hughes shared her experiences of working overseas, including in Northern Sri Lanka with MSF. emphasising the importance of resource based decision making in challenging environments with very limited equipment. Dr Hughes highlighted the importance of organisations being self-sufficient when providing aid to developing countries and assisting and training local healthcare professionals for lasting positive outcome. ​ A member of the Hereford and Worcester Fire and Rescue Trauma Team, Jayne is recognised as making an exceptional contribution to the service and communities she serves. in 2016 Jayne won both the UK national trauma challenge and the Irish National Challenge - demonstrating her excellent skills in advanced casualty medical care. The conference saw Jayne share her experience of the fire bridge and a cardiac arrest case study. Jayne spoke about the challenges between crew safety and perception from the public in controlling fires. ​The afternoon saw practical skills sessions on Major haemorrhage control by assistant lead paramedic Sean Harris and Police Medic Andrew Barrett. This was followed by orthopaedic practical skills - splinting, fractures and breaks in the prehospital session taken by HEMS Dr Aswinkumar Vasireddy. Saturdays moulage reenacted a fire in a nightclub with mass casualties - students put their triage skills to the test as first responders in a challenging environment. Casualties were transported to a casualty clearing station where delegates were assessed on their primary survery and management of these patients. The evening concluded with a drinks reception in the Pathplogy Museum at St Bartholemew's Hospital. Following nearly 30 years of search and rescue experience with the Royal National Lifeboat Institute and HM coastguard combined with the latest medical research Mr Savage will give his highly praised talk on the ‘Seven Ways Cold Water Kills’. Paul talked our delegates through the stages of survival for submersion and immersion casualties, detailing the physiological changes occurring at these times and outlining the immediate and correct medical treatment required in these cases. Paul was responsible for the operational medical response of all of the UK and Eire’s Lifeboat crew, Lifeguards and Flood Response teams, as well as the architect and custodian of the Clinical Governance of the RNLI. He advised on all matters casualty care related - from kit carried, casualty care course design to casualty-friendly boat design.Paul is Chairman of the UK Search and Rescue Medical Group that shapes the future and direction of UK SAR medicine, and is a member of the Main Advisory Board and the Training and Standards Board of the Faculty of Pre-Hospital care of the Royal College of Surgeons (Edinburgh). He is also an instructor for specialist elite sections of the UK Military. ​ Currently consultant emergency physican and Medical Director of Queensland Ambulance Service (QAS), Dr Rashford is one of Australia’s leading emergency medicine specialists. With more than 20 years experience in aero-medical retrieval, medical assistance and pre-hospital care, currently working with London’s Air Ambulance. ​Dr Rashford has a plethora of experience and publications in a variety of aspects in pre-hospital and emergency medicine and as Medical Director of QAS he maintains standards that ensure the highest level of patient care. At the conference Dr Rashford discussed the challenges of exploring the scene involving interfacility transfer of critically injured patients in Australia as well as international transfers. Dr Rashford spoke about his expereinces in PHEM in Australia and how patients are monitored during such long distance flights and discuss how to spot the signs and premempt deterioration. Spoke through the importance of understanding the differences in humdity and dehydration when transferring patients at high altitudes. ​The morning concluded with a talk on human factors by Dr Gareth Grier - co-convenor of the iBSc in Prehospital Medicine, alongside Dr Goodsman. A consultant with London's Air Ambulance and consultant in Prehospital and Emergency Medicine in the Barts Health NHS Trust; Dr Grier is also the director of the Institute of Prehospital Care, where he leads the education of doctors and students in prehospital medicine. Dr Grier discussed the importance of recognising human factors that contribute to the challenges faced when managing patients in the prehospital environment. 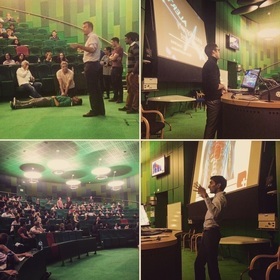 ​The afternoon consisted of a talk by Professor Simon Holmes​: Lead Cranio-Facial Trauma Surgeon at Barts Health. Professor Holmes discussed the managament of complex pan-facial injuries for both primary and revision trauma surgery, and the challenges faced with such complex surgery. Skills workshops were ran on airway management by PCP Alumni. ​Sunday's moulage allowed us to take advantage of the sunshine in the courtyard of St Bartholemews Hospital - were a collision of two boats was reenacted. Delegates were assessed on their ability to triage and effiiciently extricate multiple casualties from a difficult area with a range of injuries. They were then transferred to a casualty clearing centre where theywere assessed and managed. The scenario allowed delegates to utilise the information from Paul Savage's talk on the injuries sustained, and causes of death by drowning, and also emphasised the impact human factors can play in challenging environments with multiple casualties and limited resources. We would like to thank everyone who made the National Conference a success and to all of the delegates who attended, making it what we felt was an educational and enjoyable weekend. 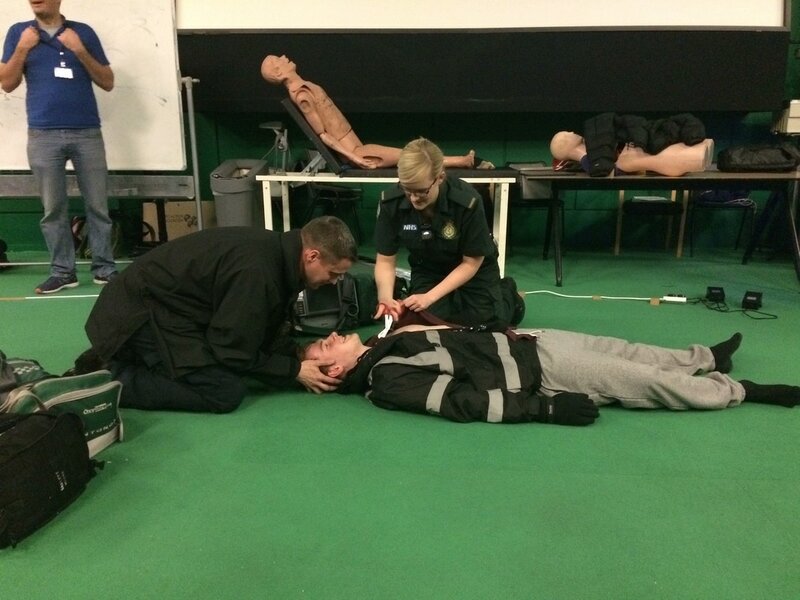 This year our PCP students have been involved in multiple practical sessions, designed to develop the skills required when in the prehospital environment and enhance our team work and communication skills. Thepractical sessions are developed by our practical officers on the committee - Shiv Sharma and Mark Murphy. Here are some of the things are students have been up to this academic year: Airway intubation and chemical warfare PPE, splinting and packaging, BLS and ALS, and two moulage practicals. One moulage practical was designed and ran by members of the HEMS team and the other was designed and executed by the students, allowing them to think through the medicine behind the scenarios to enable them to be reenacted as realistically as possible. ​In addition to these practical sessions, a student led D&D has taken part once a month. This allows our students to discuss cases they have observed in a safe environment, and reflect and learn from one another. The evening began with Louise Elstow; a consultant in Emergency Management for a range of clients in public and private sectors; both in the UK and internationally. Clients across a wide range of bases. including: healthcare, nuclear and transport industries. Louise has an MSc in risk, crisis and disaster management; and is currently undertaking a PhD in nuclear recovery and contamination issues. She was a member of the team who delivered and facilitated the LiveEx in Exercise Unified Response - in her role of coordinator. The talk delivered at the forum described the exercise unified response training exercise that was executed last year. The training programme involved over 100 organisations - including all members of the emergency team, including those from abroad. 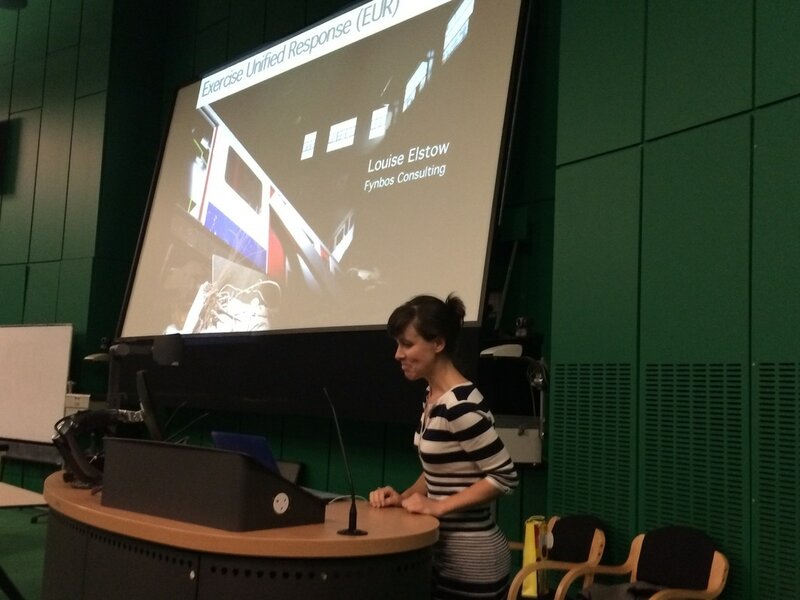 Louise explained in detail the set up of the mass casualty, which was based on two underground trains colliding, with multiple casualties. The complexitiy of scene management and multi-organisation response was highlighted, especially with the incorporation of aid received from the EU. It was interesting to see the learning points that were raised, and how each branch of the emergency services is developing their protocols and plans with regards to a major incident, in response to this exercise. See the video for how this exercise was executed. After a short break, and information regarding the new PCP application process, we were joined by BSc PCP student Matthew Dawson. Matt delivered his dissertation talk on gang and youth violence in relation to an event he attended whilst on a PCP shift. The case presetned was a young man who had been stabbed, which resulted in a thoractomy and transport to hospital. The talk focused however on our perceptions of young people who become victims to crimes such as this, with empahsis on the fact that "Serious youth violence does not always equal gang crime". The talk concluded with some key learning points regardng how violence in these subgroups of young people can be reduced and prevented, through organisations such as St Giles Trust and Street Doctors by breaking the cycle of offending. A new month brings us another academic forum and February's theme was that of paediatric prehospital care. Caring for an acutely unwell child poses its own challenges some of which were explored in this evenings discussions. ​The evening began with MRU paramedic and PCP mentor Curtis Rutter, who gave an excellent introduction to assessment and management of a child in a prehospital setting. talking through the ABCDE approach and the different challenges posed in paediatrics and signs to look out for. Curtis then went on to discuss a case he recently attended with a child in anaphylaxis, talking through the Resus UK paediatric guidelines. ​After a short break we heard from 1st year PCP student Jess Froggatt, who portrayed to us the challenges we are faced with when attending a difficult case, such as an out of hospital cardiac arrest, involving a child and their family. Talking through a case recently attended with the LAS Jess perfectly described the thoughts and feelings those in the medical profession all face when attending a difficult case. Human factors, including the concepts of band width and becoming task focused, as well as the importance of debriefing difficult cases were widely explored. 2017 welcomed us into a PCP forum like no other! With the Perrin Lecture Theatre packed full; the evening began with Dr Ben Singer, consultant in critical care, ECMO and anaesthetics, as well as HEMS emeritus for KSS discussing prehospital ECMO. 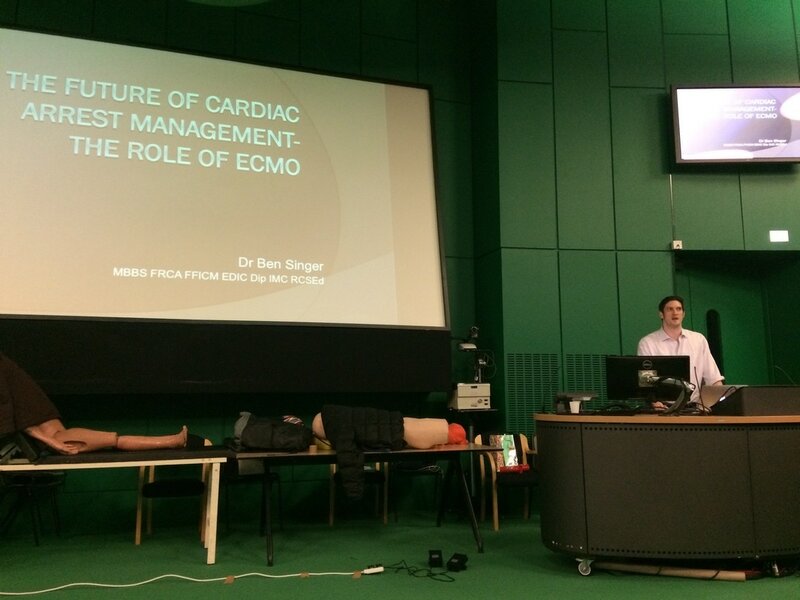 Dr Singer spoke about the role of ECMO (Extra-corporeal membrane oxygenation) in a prehospital cardiac arrest scenario. It was emphasised the importance of being able to administer ECMO within a 30 minute window in order for better outcomes - with evidence showing an increase in survival post discharge from a prehospital cardiac arrest from <10% to 30%. Dr Singer provided an insightful account of his own experiences of ECMO and what the future held in this exciting area of prehospital care. ​The second half of the forum provided a bit of a twist compared to the normal AF setup. 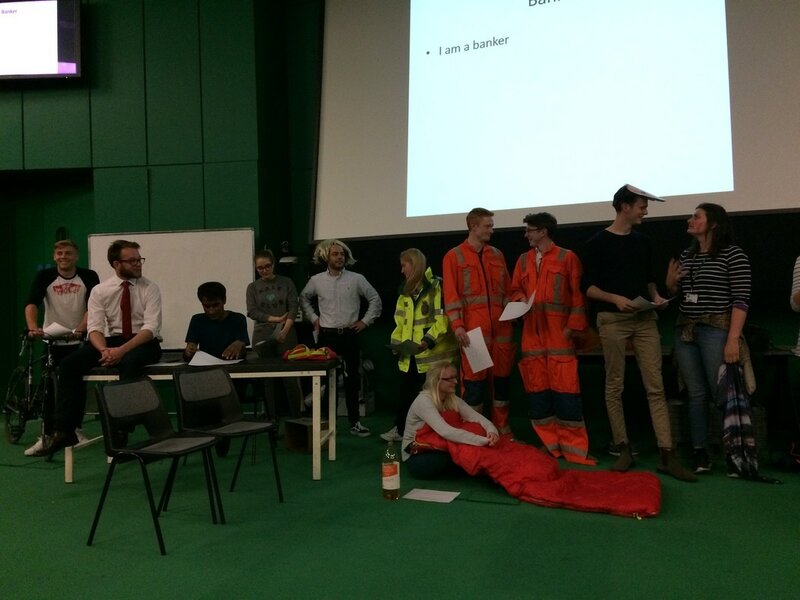 Based on a case attended by PCP student Ella Smith, a real time re-enactment was performed of the case: starting with the 999 call through to the handover in A&E. We were privileged to have HEMS, LAS and Police Medics participating in the live demonstration, giving the audience a real time account of what happens at a call out, in this scenario of a motorcyclist involved in an RTC. The interactive session gave audience members the opportunity to think through what they would do if they were in the shoes of either the doctor and paramedic on scene. The forum was wrapped up with a discussion based on the case from the live demonstration, allowing both the participants and the audience to reflect on the difficulties the case presented. ​2017 is off to a great start and we look forward to seeing you all on February 28th! Our second academic forum of the year kick started with 2nd year PCP student Catharine White presenting a case discussion of a hemorrhage patient observed whilst on shift. This moving account was accompanied by on key learning points when managing such a patient. This was followed by Lead Clinician for the Prehospital Care Programme, Consultant in Emergency Medicine & Prehospital Care at The Royal London Hospital, and Lead Clinician for London's Air Ambulance Dr Ann Weaver. In keeping with the theme of haemorrhage; Dr Weaver talked about the challenges of administering prehospital blood products and the research that is being done to optimise this. ​Our first Academic Forum of the year had a great response with the Perrin LT being packed out with medical students and LAS members. ​Tonight's theme was on Medical vs. Traumatic Cardiac Arrest. The evening kicked off with a case presentation by 2nd year PCP student Jack Dryburgh-Jones discussing a medical cardiac arrest attended on an FRU shift. ​Jack talked through his own experience of a medical out of hospital cardiac arrest. Multiple aspects of the case were discussed including scene management and conducting a primary survey; highlighting the difficulties in the assessment of a non-responsive patient in the prehospital setting. LAS guidelines on management of a cardiac arrest were discussed, including the eight reversible causes. In keeping with the case scenario further teaching was provided on hypovolaemia within cardiac arrest. Jack’s talk concluded with a discussion; emphasising the importance of reflecting on difficult cases. This was followed by a talk from HEMS Anaesthetist Dr Miller; who has experience not only working for LAA but also Sydney HEMS and Surrey Sussex Air Ambulance Trust. Dr Miller spoke about traumatic cardiac arrest and the challenges within the pre-hospital environment. This was reinforced by discussion on the difficulties of gathering and comparing data on traumatic cardiac arrest. We hope this forum sets a precedent for the upcoming year and we look forward to seeing you on the 29th of November. We've had our final public Academic Forum of 2015, and by all accounts it was a fantastic night! Tonight's theme was on Haemorrhage and Shock, and we kicked off with a talk from St George's Hospital Paediatric Emergency Consultant and Kent & Surrey Air Ambulance Consultant Dr Kevin Enright. Dr Enright talked about the history of doctors in the prehospital field and the recent advances in carrying blood/blood products via the air ambulance out to prehospital scenes. He then talked through a number of cases and mechanisms of injury, from splenic rupture to aortic dissection, and bleeding head injuries to tension pneumothoracies forgotten in the panic of treating bleeding. Overall Dr Enright's talk will ensure there's now 200+ prehospital clinicians well armed for recognising and treating haemorrhage. For the second half our audience broke into year groups, with first years going through the ABCDE approach, second years learning practically how to deal with haemorrhage, third/fourth/fifth years learning about burns management and fluid replacement, and paramedics/paramedic students going trough when and when not to use to fluids in the prehospital environment. 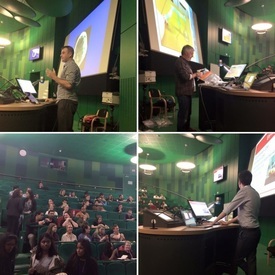 We have to give special thanks to Dr Anne Weaver, Dr John McKenna, and Lead Paramedic Sarah Mortimer from London's Air Ambulance; PC Andrew Barrett a police medic; and a huge number of LAS Paramedics for giving up their time to teach students all about haemorrhage and shock. Finally we can't finish without mentioning our very Dr Gareth Grier, who won the Association of Air Ambulances Doctor of the Year award last week! A huge congratulations and well done to an inspirational leader and teacher. We hope to see you all back in January for the next academic forum on London Trauma. We've taught Airway, Breathing, and Circulation in 2015... 2016 will be bringing high profile cases and complex trauma to the PCP Academic Forums! Another month, another Academic Forum! This month's focused on airway management and respiratory emergencies, and we're fairly certain nobody's going to neglect the airway after tonight. We began with PCP and Prehospital Medicine iBSc student Mark Murphy discussing a hanging case. Mark brought in academic papers as well as his own experiences to talk through the steps in managing a compromised airway, airway adjuncts, and even the principles of rapid sequence induction. Next up Lead Paramedic Craig Cassidy spoke about a case of severe asthma which saw a patient go from being essentially well to exceptionally unwell in a matter of minutes. Craig discussed the management of asthma, but also imparted fantastic advice about dealing with frightening situations. Finally Dr Gareth Grier taught about rapid sequence induction (RSI; prehospital general anaesthesia) in terms of the procedure as well as which cases it would be indicated in. We then finished the night using television medical dramas to demonstrate how forgetting the airway can be devastating. We were also lucky enough to be joined by students from Aarhus University's Anaestheisology and Traumatology Society from Denmark! The PCP is going international! Overall a wonderful evening and we hope to see you in November for Haemorrhage and Shock. We had an amazing first night back with the Cardiac Arrest Academic Forum, thank you so much to everyone that made it possible and everyone that joined us for the evening. The night started off with a welcome address by Lead Student Siobhan Williams, who told everyone what the PCP is all about and what to expect in the year to come. Next up was PCP student Prasanth Sritharan who presented a cardiac arrest case he attended; as well as teaching all about reversible causes of arrests, ABGs, ECGs, primary survey, and physiology of blood pressure! An exceptional presentation that even had people on their feet acting out heart rhythms! Following that was Conrad Witek, an almnus from the inaugral year of the Barts and The London Prehospital Medicine intercalated BSc. Conrad told us all about the role of echocardiography during cardiac arrest, as well as re-affirming the importance of good quality CPR. Everyone will have taken something away from what was called a conference-worthy talk by a doctor in the audience. Finally Dr Jenny Townsend spoke about thoractomy and what extra skills the London's Air Ambulance can bring to cardiac arrest. Jenny inspired everyone by telling her story, from being an excited prehospital-interested student (just like those in the audience) to now being a London Air Ambulance doctor. She also covered scene safety and crowd management, important skills in the prehospital environment. To end the night Dr Gareth Grier found some volunteers to enact a stabbing scenario complete with LAS responders, LAA arrival, and ultimately a thoracotomy (though thankfully no volunteers actually received a thoracotomy!). Overall a fantastic evening filled with fantastic teaching, interactive scenarios and hopefully inspiration for future generations of doctors and paramedics. We hope to see you on October 27th for the next Academic Forum!